Hey, La Grange, IL– how about some natural summer skin care tips? Summer time is in full swing! With all the fun things to do—camp outs, swimming, and barbecues, your skin can really suffer. Sunburns and bug bites can really dampen summer fun. Luckily, you don’t have to spend a fortune on chemicals at the store to take care of these summer irritations. Here are some natural ways to heal and soothe your skin this summer. Sunscreen: Since there is a lot of debate in the medical community surrounding sunscreen, we won’t get into that here. However, since no one likes a sunburn, let’s look at some natural ways to avoid it in the first place. Know your limits: Different skin tones have different levels of tolerance for sun. You probably already know how fast your skin will burn. Obviously, the lighter your skin, the faster you will burn. However, darker skin tones will burn also, and your results are every bit as painful. In general, experts say safely, people with lighter skin tones should only stay in the sun for about 5 minutes, and people with darker skin tones should only stay in the sun for about 30 minutes. But summer fun lasts so much longer than that! Cover up: One option is to cover up exposed skin with hats and roomy long-sleeved shirts. Good fabrics for covering up on a hot day include organic cotton, silk, or rayon as they are light and provide plenty of air circulation. Run for shade: It’s hot in the sun anyway, so in addition to making sure you are drinking plenty of water, utilize tents at summer festivals (like the upcoming Endless Summerfest) not only to cool down and avoid heat stroke, but also to keep the sun off your skin. No shade in your backyard or on your balcony? Try some sun canopies. Hitting the beach or the pool? Bring an umbrella and invite friends to relax with you. DIY potions: Finally, if you just can’t stay out of the sun, you crave a tan, or none of the other options are available to you, try mixing up your own sunscreen out of natural ingredients. Run a quick internet search, and you will find a plethora of homemade sunscreen recipes, many of which will also give you approximate SPF recommendations. However, one of the quickest and easiest recipes is to add a few tablespoons of non-nano zinc oxide to a bottle of your favorite lotion or to a jar of coconut oil. These plants can help keep the biters away, but keep in mind, they will not help with an infestation. Also, don’t forget to use some of the essential oils of these plants listed above (especially citronella) topically on your skin to further discourage biters and stingers. It happens to all of us. You may not even notice that you have burned, just that your clothes are suddenly scratchy or your soft towel feels like it is scraping you after a shower. Then you notice the reddening of your skin and realize you should have gotten out of the sun sooner. Aloe vera: No, your grandmother was not fibbing about this. Snip a leaf off of this stunning succulent, split it, and apply the gooey insides to your burn for instant cooling relief! Tamanu Oil: This oil, derived from the nut of the South Pacific Ati tree, is reputed to take care of nearly any skin problem, and especially sunburn. Since proponents claim it has both analgesic and anti-inflammatory properties, it can heal and soothe sunburns in no time. Rumor has it that the oil also turns burned skin to tan skin overnight! Lavender Oil: Also reputed to have anti-inflammatory properties, lavender oil added to a cool bath can soothe a burn in no time. Try it a few times a day in a carrier oil directly on your skin for quicker relief. Witch hazel: A skin care superstar, witch hazel, applied in the form of a dampened cloth for 20 minutes, 3 or 4 times a day should bring down the inflammation of sunburn and help lesson peeling and itching. Insects love summertime, too! So even if you did sit right next to your citronella plant all evening while snacking on cheese and sipping on wine with your friends, you could still come home with those tell-tale itching bumps that burn when you scratch them. What to do about those nasty bites and stings? 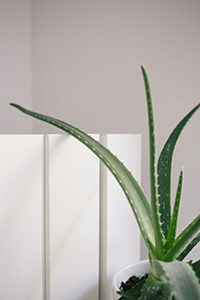 Mosquitoes: Need any more reason to invest in an aloe vera plant? In addition to the plant’s superiority in sunburn relief and healing, it is also great for mosquito bites. Don’t have an aloe vera plant? Try chopping some basil up into a fine paste and putting directly on your bite. It should take the itch away. Wasps and bee stings: Provided you do not have to carry an EpiPen for bee and wasp stings, some of these plants should soothe any wounds you may incur after upsetting one or more of them. Aloe vera comes to the rescue again, taking down inflammation and easing the pain. If you don’t have access to aloe, look around (especially if you are hiking far from home) for common or long leaf plantain leaves. Crush them and apply them directly to the sting. Not sure what these are or if they grow in your area? Try some parsley juice or an infusion of fresh mint. Have a funner summer, not a bummer summer! Nancy Miller, Realtor with Coldwell Banker is here for you, whether you are buying or selling your home. With over 25 years of experience in the La Grange, Illinois area, she knows how to enjoy the summer here–and how to recover from it. Contact her today to get started with your summer home buying and selling project!